· TRAINED MORE THAN 1000 PROFESSIONNELS PAN INDIA. · RECIPIENT OF “INSPIRING WOMAN ACHEIVERS AWARD Y2016”, “ MEDIA EXCELLANCE AWARD Y2016” & “GAURAV AWARD Y2015” AS “MOTIVATIONA GURU”. · PRODUCER OF FAMOUS TRAVEL SHOW ON ETV “PRANAM BHARAT”. 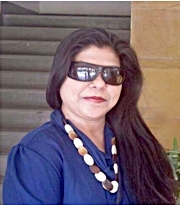 Here are Excerpts of her interview with S.S. Dogra – Mg. Editor -Dwarka Parichay. I am basically from Ranchi, Jharkhand but my formative years were spent in Bhagalpur, Bihar. Currently I stay in Bhiwadi, Rajasthan. What is Pallavi as a person known as? As a person I am commonly known as a “Creative Icon”. I strongly feel there is lot of creativity in my persona. This is reflected in my writings, my life skills trainings & production. I am lucky to get a chance to choose my passion & personal skills as career. I have recently been awarded with “Inspiring Woman Achievers Award- Film making “by All India Achievers Committee (AIAC) and “Media Excellence Award” by BBIS Media Club & Creatives World Association, New Delhi, Year 2016. I did recognize the traits early in my school life. Then I used to write small poems & essays for Inter-school competitions in fluke & used to be happily surprised by prizes. But professionally I considered myself as a writer upon release of my first novel “Mystique” in the year 2011. After penning my third book, I strongly felt the need for visual impact for my stories. This drove me towards the third wing of my services i.e; production. Today TV & Cinema are strong tools for mass viewership so touching lives of people & spreading awareness become easy here. I have two modes of narrating my stories to people now- through my books & through TV shows & cinema. Tell us about your first Production and your experience about it. My first production was a TV Show “Pranam Bharat” which was a Cultural Travel Show. It was a non-fiction TV series showcasing rich unseen cultural heritage of India and was aired on ETV Rajasthan. My experience was super informative and euphoric. Well, my current projects are production of two feature films under the banner of “Pallavi Prakash International”. First one is a Bhojpuri movie titled “Mohabbat Ke Saugaat” which is slotted to release by Feb 2017 & second is a Hindi movie “Naughty at Forty” which is in pre-production phase currently. While first one on the strong theme of “Women Empowerment”; second is a light entertaining family saga. The need to connect with people with my thoughts was greatest inspiring factor. Since I was good at writing& was already writing for various newspapers, I chose this tool. Well, the theme of the book is realistic. If you don’t respect love, love will not respect you and you always don’t get a second chance. One should not reject love for being overly ambitious. However the presentation of the book is fictionalized to give the feel of intense love story to readers. It is a lovely tale of two lovers finding love across two lifetimes. For romance lovers, it is a treat. What books have most influenced your life. Yes, there are few books which have deeply influenced my life. I have cried, laughed & rejoiced with them as a reader. In fiction category-“Remembrance” by “Danielle Steel”, “Love Story” by “Erich Segal”&“Doctors” by “Erich Segal”. In Non-fiction category “Unleash the Power Within” by “Tony Robbins” have influenced me. What advice will you give to our readers & viewers. Choose a career matching your skill sets & passion and not out of social pressures. If you do so you are already fifty percent successful. Have a life plan ready at early stage to cover rest fifty percent. By doing so, nobody can stop you from being super successful.